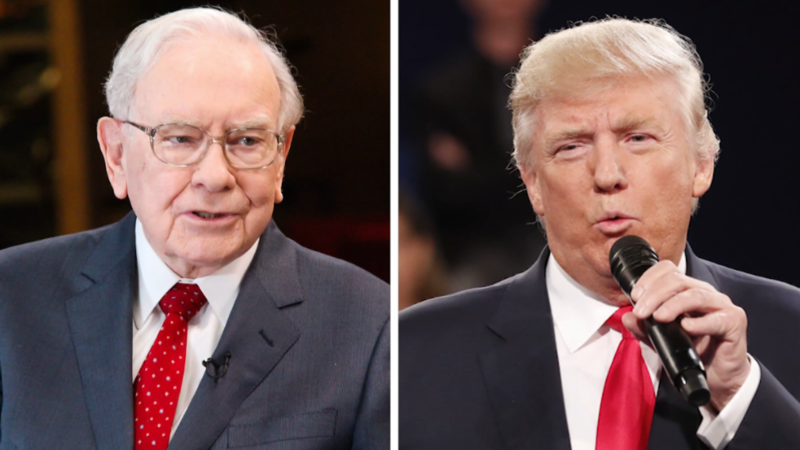 Warren Buffett schooled Donald Trump on Monday about the taxes of a billionaire. "Mr. Trump says he knows more about taxes than any other human. He has not seen my income tax returns. But I am happy to give him the facts," Buffett said in a statement. Buffett was responding to an exchange in Sunday's debate in which Clinton called on Trump to release his tax returns. Clinton has blasted Trump for using the tax code aggressively to avoid paying federal income tax. "Many of her friends took bigger deductions. Warren Buffett took a massive deduction," Trump said. On Monday, Buffett said that in 2015, he reported an adjusted gross income of $11.6 million and took close to $5.5 million in total deductions. The majority of those (nearly $3.5 million) reflected allowable charitable contributions. He went on to say that he paid nearly $1.9 million in federal income taxes last year. That gives him an effective federal income tax rate of about 16%. Indeed, Buffett added, "I have paid federal income tax every year since 1944, when I was 13. (Though, being a slow starter, I owed only $7 in tax that year.) I have copies of all 72 of my returns and none uses a carryforward." Though Trump has yet to release any of his tax returns, the top pages of his state tax returns from 1995 were released anonymously. And they show that he reported $916 million in net operating losses that he was carrying forward. That loss could have been used to offset much of Trump's tax liability for many years, potentially even reducing it to zero. But unless he releases his tax returns it's impossible to say for sure. Buffett also said in his statement that the charitable deductions he took in 2015 don't reflect the half of what he gave to charity last year. "The total charitable contributions I made during the year were $2,858,057,970, of which more than $2.85 billion were not taken as deductions and never will be. Tax law properly limits charitable deductions." Generally speaking, taxpayers can't claim charitable deductions that exceed a certain percentage of their AGI (typically between 20% and 50%, depending on what is being donated). "In Buffett's case, his income will never be big enough to allow him to deduct all of his billions of dollars of donations," said Roberton Williams, a senior fellow at the Tax Policy Center. In 2010, Buffett along with Bill and Melinda Gates launched the Giving Pledge. They and fellow billionaires who join, pledge to give away most of their wealth during their lifetime and in their wills. This past July, Buffett pledged $2.9 billion worth of stock in his holding company Berkshire Hathaway (BRKA). Trump has not provided any proof of his charitable giving, though he boasts of it often. Again his tax returns would offer a window into the amount of money he gives away in a given year.